Gilchrist, C.w.. "Alaska Highway". The Canadian Encyclopedia, 30 June 2016, Historica Canada. https://www.thecanadianencyclopedia.ca/en/article/alaska-highway. Accessed 21 April 2019. 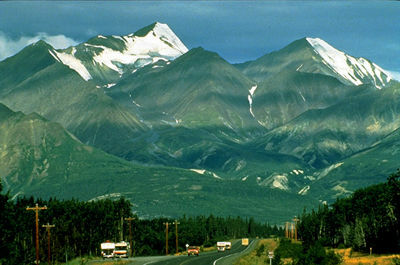 Alaska Highway, constructed 1942-43 from Dawson Creek, British Columbia to Fairbanks, Alaska. In the face of a serious threat of a Japanese invasion, a preliminary road was rammed through forest wilderness and 5 mountain ranges in only 8 months. 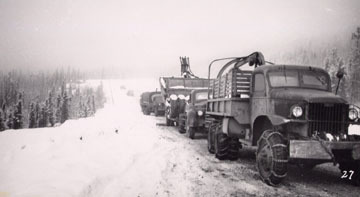 A United States Army convoy along the Alaska Highway, 1943-44 (courtesy Provincial Archives/P6826). Although originally built for military purposes, the highway has helped the forestry, oil, mining and tourist industries. Alaska Highway, constructed 1942-43 from Dawson Creek, British Columbia to Fairbanks, Alaska. In the face of a serious threat of a Japanese invasion, a preliminary road was rammed through forest wilderness and 5 mountain ranges in only 8 months. Called the Alcan Military Highway, it ran 2333 km from Dawson Creek to Big Delta, Alaska. Groups of US Army engineers working from several starting points built up to 13 km a day. The following year it became a permanent, all-weather, gravel-surfaced road, 7 to 8 m wide, 2451 km long, from Dawson Creek, BC, to Fairbanks, Alaska - the result of the labour of 11 000 soldiers and some 16 000 Canadian and American civilians. Along it were 133 bridges 6 m or longer and several thousand culverts. The US invested $147.8 million in the project for men, materials and equipment. 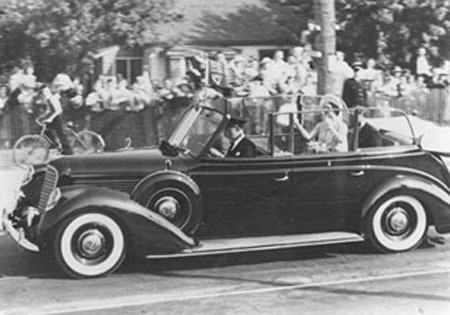 Canada provided the right of way and on 3 April 1946 took over the 1954-km portion of the road from Dawson Creek to the Alaska border. Canada paid the US $108 million to cover airfields and flight strips, buildings, telephone systems and other assets, but not construction of the highway itself. Opened to unrestricted travel in 1947, the road was regraded and widened by Canadian army engineers during the next 17 years, until it was turned over (1964) to the federal department of public works, which has continued to improve it. Some of the road has been paved, but hundreds of kilometres are bituminous surface-treated to carry the traffic, which ranges from 220 vehicles a day in isolated areas to 1700 a day near Whitehorse. Maintenance is a continual battle against nature, with floods and landslides in spring and blizzards and extreme cold in winter, when temperatures of -48°C can cause bulldozer blades to crack like glass. Although originally built for military purposes, the highway has helped the forestry, oil, mining, tourist and trucking industries. It provided an important impetus to the development of Edmonton as a supply centre and, as an enduring link to northern BC and the Yukon, has had the psychological benefit of ending the isolation of the North. K. Coates, North to Alaska: Fifty Years on the World's Most Remarkable Highway (1991).